THE MAIN ENTRANCE TO WATERLOO STATION, which has twenty-one platforms, the longest of which is 860 ft. The extensive rebuilding of the station, delayed by the war of 1914-18, was completed in 1922. The LSWR War Memorial is incorporated in the archway. THE Southern Railway is the smallest of the four great railways brought into being by the Railways Act of 1921. Its route mileage is only 2,186, all, except nineteen miles, of standard gauge. But it has many claims to fame. It owns the largest passenger station in the British Isles, as well as the one with the greatest number of trains a day. Its traffic is denser than that of any of the other British railways. It owns the chief passenger port in the kingdom, in addition to claiming the lion’s share of cross-Channel traffic. It has the largest suburban electric mileage in the world. Furthermore, its season ticket traffic between London and Brighton is unparalleled; its system includes the first railway to enter London; and it is the only one of the four great railways to be confined to England. The Southern is pre-eminently a passenger line. While the bulk of the receipts of the other main lines is from mineral and merchandise traffic, about three-quarters of the earnings of this company are derived from passenger train working. No other great railway undertaking in the world carries so large a proportion of passengers in relation to its total business. It is not generally realized that while its mileage amounts to less than one-eighth of the British main line total, it carries over a quarter of the passengers. It is surpassed in this direction only by the London, Midland and Scottish Railway, with a route mileage more than three times as great, while it conveys more than double the passengers of the Great Western Railway, whose route mileage is considerably over half as much again. From the geographical standpoint, the Southern Railway is much the most compact of the British systems. An exceptionally large proportion of its mileage is within twenty-five miles of London, where it owns more terminal stations than the other three railways put together. This is partly due to the density of the suburban network, partly to the strenuous competition that at one time existed between its principal constituents. In its present form the Southern consists of a number of undertakings that were amalgamated in 1923 as a result of the Railways Act of 1921. These undertakings had themselves absorbed several smaller railways in the distant past, including the London and Greenwich Railway, which was - in 1837 - the first railway to enter London. The main framework of the system consists of four important railways - the London and South Western; London, Brighton and South Coast; South Eastern; and London, Chatham and Dover. Their respective route mileages were 1,019, 457 and 638 (taking the last two together). The Southern has absorbed also a concern which, although it did not own a mile of line or a locomotive, was yet of first class importance. This was the South Eastern and Chatham Managing Committee, which had a somewhat curious history. After many years of the most severe competition in the annals of the British railways, the South Eastern and the London, Chatham and Dover companies decided that it would be more profitable to work in harmony. But, as the law then stood, amalgamation would have necessitated the spending of a very large sum in stamp duties. It was therefore decided in 1899 to set up a Managing Committee for the purpose of working the two systems as one. Although each retained its separate identity as a company, the receipts of the whole undertaking were pooled in an agreed proportion. The Committee continued to exist until 1923. Other lines absorbed in 1923 included the Plymouth, Devonport and South Western Junction, the miniature Lynton and Barnstaple, and the three railways in the Isle of Wight - the Isle of Wight, the Isle of Wight Central, and Freshwater, Yarmouth and Newport. In all there were amalgamated five constituent companies and fourteen subsidiary companies, the last of which was not included till 1924. The system radiates from London and extends to the coasts of Kent, Sussex, Hampshire, Dorset, and Devonshire. From Sheerness to Bournemouth it has virtually a railway monopoly. Farther west it shares the traffic with the Great Western, as at Exeter and Plymouth. One long branch stretches through Devonshire to Ilfracombe, and another ends at the Cornish port of Padstow. 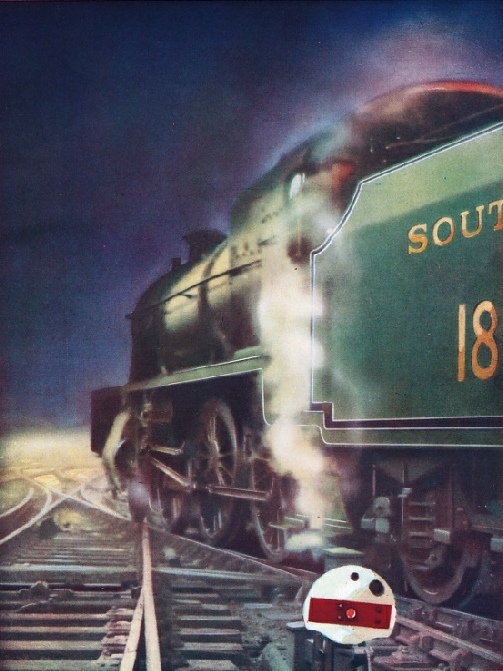 As the joint owner with the LMS of the Somerset and Dorset, the Southern Railway has interests as far afield as Bath and Burnham-on-Sea, in Somerset. In 1935 the company owned 1,919 locomotives, 6,647 coaching vehicles, 33,584 freight vehicles, and 2,054 electric vehicles. As the South Eastern Railway took over the London and Greenwich line in 1845, it must be regarded as the oldest of the lines comprised in the Southern. It may also claim seniority by virtue of its ownership of a still older line - the Canterbury and Whitstable - which was one of the world’s earliest public railways. This little line was opened in May, 1830. and thus slightly antedated the Liverpool and Manchester Railway. Many people may have been puzzled why two such comparatively small places as Whitstable and Canterbury should have had the benefits of railway communication at so early a date - six years before London itself. There is a simple explanation. The conveyance of coal and general merchandise to Canterbury had become handicapped owing to the silting up of the River Stour, and on the advice of William James, one of the pioneers of the railway, who is said to have put forward the original project for the Liverpool and Manchester, a railway was proposed to cheapen the cost of carriage. The Canterbury and Whitstable, which was sanctioned by Parliament as early as 1825, was only ten miles in length. It is doubtful whether any other railway of such small size was ever worked simultaneously by so many different forms of motive power. These originally comprised three fixed engines, horses, and a single locomotive, the variety being due to the undulations of the line. A VETERAN LOCOMOTIVE. One of the oldest engines on the Southern system is the “Ryde”, built in 1864. The locomotive, which has attained a total mileage of over one and a half millions, operates in the Isle of Wight, and is here seen at Brading. The first engine, it may be recalled, was the historic “Invicta”, built by Robert Stephenson. This locomotive, which was the second to leave the Stephenson factory, was similar in general design to the “Rocket”, save that its four wheels were coupled. It is still preserved, and reposes to-day in a public park in Canterbury. Soon after the Canterbury and Whitstable Railway was opened, its operation by locomotives was suspended, but on its being leased to the South Eastern Railway in 1844 it was re-laid for locomotive traction. There is a tunnel on the railway which is unusually narrow at the Whitstable end. According to the generally accepted story (to which there is an exact parallel in the early days of the Belgian Railways) this was built not because it was necessary, but because in those days no railway was considered as being really complete without one. IN THE SHOPS. Rows of coaches owned by the Southern Railway receiving a fresh coat of paint in the Company's works at Lancing, Sussex. The Southern Railway has over 6,600 coaching vehicles, nearly 33,600 freight vehicles, and over 2,000 electric vehicles. The dimensions restricted the size of the rolling-stock on this line for the whole period of its operation. The passenger train service was withdrawn in 1933. But to return to the South Eastern proper, with whose history, it should be pointed out, that of the London, Brighton and South Coast, as well as the London, Chatham and Dover, was associated from very early days. In 1825, when the Stockton and Darlington was opened, and the project for a railway between Liverpool and Manchester was getting itself very much talked about, the idea arose, “Why not also a railway from London to Dover?” A number of schemes were put forward, including one in 1833 for a line via Maidstone, but the determined opposition of powerful vested interests defeated them all. LONDON BRIDGE STATION as it appeared many years ago. The building on the left is part of the South Eastern station ; the London, Brighton and South Coast station is seen on the right. Both these railways are now absorbed in the Southern Railway. Then, in 1835, the London and Croydon Company - the forerunner of the Brighton system - obtained its Act of Parliament. In the following year, various rival schemes were in the field for the construction of a railway between London and Brighton, and yet another Dover project was mooted, for a line from Redhill, via Tonbridge, Ashford, and Folkestone. A year later, the Brighton Company received its Act of Parliament, and as this measure imposed so many restrictions on the construction of approach lines to London, in the interests of the London and Croydon and London and Greenwich railways, the South Eastern people were for a time in doubt as to whether it was worth while proceeding. OUTSIDE WATERLOO STATION, the “A” signal box, in the centre of a large bridge of signals, controls the station approach. The 266 levers are manually operated. Over 1,550 trains are handled daily at this great station. Eventually a compromise was reached, whereby the Brighton Company made a line from Redhill to Norwood Junction, on the London and Croydon, the South Eastern paying half the cost, and becoming owners of the southern portion as far as Coulsdon. 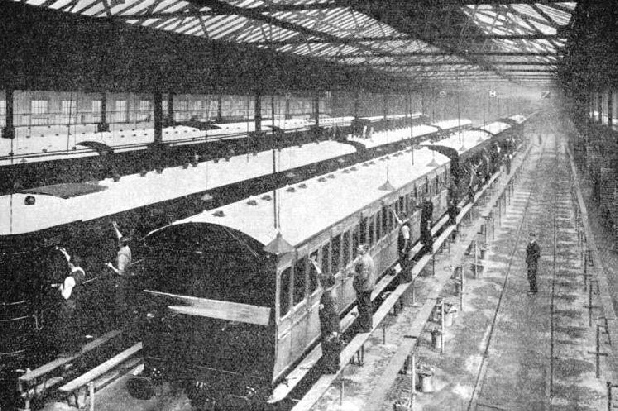 On the opening of the line, South-Eastern trains ran on their own tracks from Redhill to Coulsdon, thence to Norwood Junction on those of the Brighton system, then on to Corbett’s Lane (one and three-quarter miles from London Bridge) on London and Croydon metals, and finally to London Bridge over the London and Greenwich. The Corbett’s Lane junction, it may be recalled, is said to have had the first regular signal box in the world. “Thus”, says one historian, “were the Brighton and South Eastern in their infancy nurtured by Parliament in unpunctuality, for on such a road it was impossible to work even a moderate traffic to time”. The South Eastern’s engineer was the celebrated Sir William Cubitt, who, among other things, is said to have invented the treadmill, and who had publicly declared that, given “a perfect railway”, he could not conceive “any speed that could be dangerous to the public in a straight line”. Sir William was able to put his ideas into practice as far as straightness (if not speed) was concerned; the forty-eight-mile section of the South Eastern main line from Redhill to Ashford is almost straight and virtually level throughout. Other noteworthy features of the main line are the Foord Viaduct at Folkestone, which towers on nineteen lofty arches over a crowded district of that seaside resort; and the twin railway tunnels running through the Shakespeare Cliff at Dover. 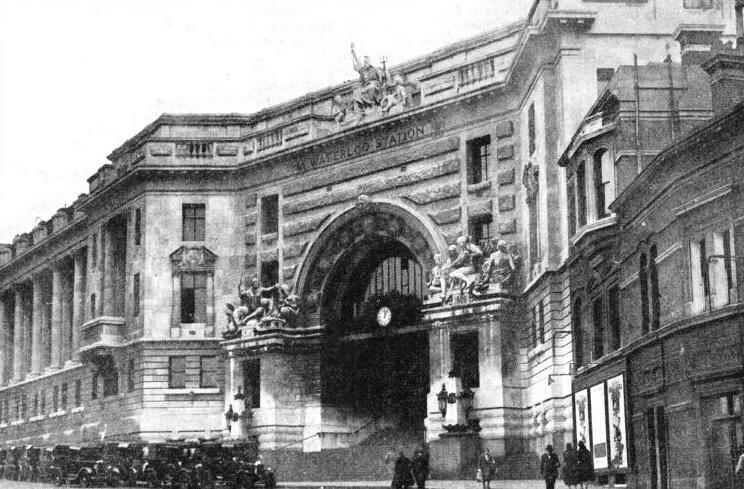 THE LONDON TERMINUS of the early railway to Brighton and Dover. This station was the predecessor of the modern London Bridge Station, and was demolished about 1850. The railway between London and Brighton was completed in 1841. These tunnels were driven through the chalk. Instead of the customary practice of sinking vertical shafts from the top, Cubitt chose the method of driving horizontal galleries. The work involved the blowing away of the face of Round Down Cliff, for which purpose 18,000 pounds of gunpowder were used. It is of historical interest to recall that this was one of the first recorded instances of firing an explosive agent by electricity. The resulting upheaval covered over fifteen acres with fragments of chalk. By May, 1842, the first South Eastern trains were able to run through between London and Tonbridge, and later in the same year the line had reached Ashford, where the locomotive shops are situated. A year later the line was opened to Folkestone, and in the year after that Dover was at length reached, and the first London branch was also opened. This ended at Bricklayers’ Arms Station, which was originally known as the company’s “West End Station”, although on the south side of the Thames. It is now used as a goods depot. Regular passenger traffic was worked in and out of Bricklayers’ Arms until the beginning of 1852. The station re-emerged as a passenger terminus for one day - on March 3, 1863 - when the special train carrying the future Queen Alexandra from Gravesend made use of it. A WEST OF ENGLAND EXPRESS climbing the formidable Honiton bank to the west of Salisbury. The seven-miles ascent to the summit involves a stretch of four and a half miles at a gradient of 1 in 80. This route serves Exeter and Plymouth, also Ilfracombe, Bude, Padstow, and other well-known resorts on the Atlantic Coast. The London, Chatham and Dover Railway traces its history back to 1853. In that year the East Kent Railway (bearing the Kentish motto, “Invicta”) was incorporated, with the object of building a line from Strood (Rochester) to Canterbury, both served by the South Eastern Railway. This line owed its origin to a scheme for developing a building estate at Herne Bay. The estate had been bought by one George Burge, in the hope that its value would be enhanced by the construction of a railway in the neighbourhood. Burge became associated with two assistants of John Rennie, one of the best-known engineers of his time. One of these was Thomas Russell Crampton, the locomotive engineer of “low centre of gravity” fame, and the designer of the “Liverpool” and many other historic engines. The three entered into partnership, with a scheme for lines from Canterbury to Rochester, via Faversham, and from Faversham to Herne Bay. Owing to the difficulties that they encountered and the lack of financial support, the other partners dropped out, and Crampton enlisted the active participation of Peto, Brassey and Betts, the great contractors, who were eventually seriously affected by the financial crisis through which the undertaking passed in the eighteen-sixties. In 1859 the East Kent changed its name and became the London, Chatham and Dover Railway. The line to Faversham had been opened during the previous year, and that to Canterbury was finished in 1860. In the meantime, Parliament had sanctioned the construction of extensions from Canterbury to Dover and from Strood to St. Mary Cray, which had the effect of converting a small Kentish undertaking into a system closely approaching the fringe of the outer London suburban area. London itself was reached in November, 1861, over a complicated route. Between St. Mary Cray and Bromley this was over the Mid-Kent Railway, which was leased to the South Eastern. At Bromley the Mid-Kent linked up with the West End of London and Crystal Palace Railway, which ended at Battersea, the journey thence to Victoria Station being over the metals of the Victoria Station and Pimlico Railway. This last concern, which maintained a separate legal existence until 1923, when it was absorbed by the Southern, was one of the many “non-operating companies” so characteristic of British railway practice. That is to say, they were the owners of a section of railway that was leased or rented to another working company. The Mid-Kent was a similar undertaking. Victoria itself is, in effect, two stations in one, those of the former Brighton and Chatham Companies being separate structures, with widely differing lay-out and architecture, and with independent approach lines. Since grouping, the two stations have, however, been connected by demolishing a portion of the wall that formerly served as a boundary between them. At one time, Victoria was served also by Great Western and London and North Western trains, but these are among London’s many vanished railway services. For many years the London and North Western, in addition to running a suburban service to and from Willesden Junction, provided a through carriage daily to Birmingham (New Street). 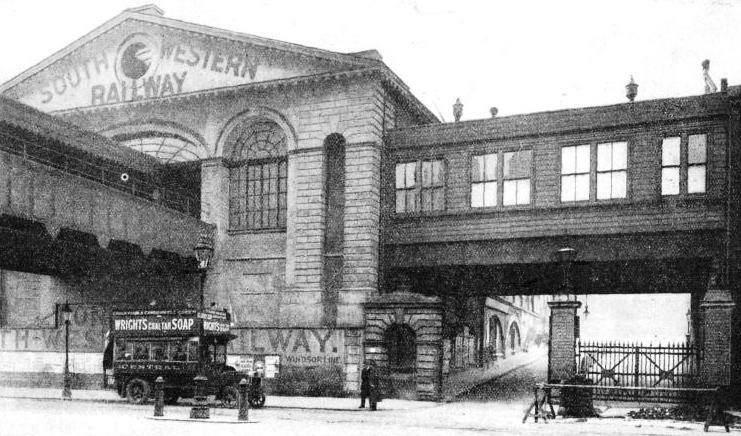 For a short time after the opening of its Bicester route to the north in 1910, the Great Western ran two expresses daily in either direction from Victoria to Birmingham (Snow Hill). THE HEART OF THE SOUTHERN. Waterloo Station is the largest station in Great Britain, and occupies twenty-four and a half acres. The Southern system includes many popular holiday resorts, and this photograph was taken at Waterloo Station during the busy holiday-time. With the entry into London of the London, Chatham and Dover, there began that long era of competition with the South Eastern to which reference has already been made. The story is too long to tell here, but mention must be made of the fact that the South Eastern found or thought itself compelled to own a shorter main line, and in 1868 opened its new route to Tonbridge, via Sevenoaks. Four years before, it had finished the extension from London Bridge to Cannon Street and Charing Cross, and the provision of these additional terminal stations gave it a great advantage over all the other main lines entering London from the south. But it may be asked whether the superiority was not bought at too high a price, since the construction of only slightly over two and a half miles of railway cost the enormous sum of four million pounds. The terminal station position was one of great importance in the struggle between the two systems. Thus, to counter the opening of the South Eastern’s Charing Cross Station in 1864, the London, Chatham and Dover opened Ludgate Hill in the same year. The South Eastern replied two years later with the more conveniently situated Cannon Street. The fight lasted for over thirty years. A good deal of the competition was of the same insensate nature as at a previous date had led to visitors to the Great Exhibition being brought by excursion from the provinces to London and back for the ridiculous sum of a shilling. But responsibility for this competition largely rested on the Parliaments that sanctioned the duplication of routes. In addition to Dover, where the prize was the very profitable cross-Channel traffic, virtually every place of importance in North Kent was reached by both lines, such as Margate, Ramsgate, Maidstone, and even Ashford, which has been described as “the holy of holies of the South Eastern”. “IRONING-OUT” A NEW LINE. 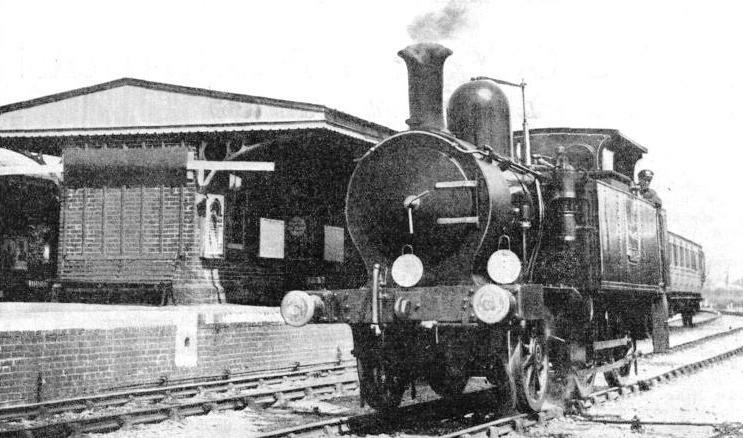 Before the Wimbledon-Sutton line was opened in 1930, one of the Southern Railway’s “King Arthur” engines proceeded up and down the track to flatten it out and thus reveal any defects. The photograph shows the 140-ton “Camelot” acting as a steam-roller. Electric trains now run on this line from Holborn Viaduct to West Croydon. It has already been shown how the fortunes of the Brighton Company, in virtue of its geographical situation, became linked up at an early date with those of the South Eastern and Chatham. Before the incorporation of the London and Croydon, Rennie had not only planned the construction of a railway from London to Brighton, but had also surveyed the route. This began at Kennington Park, and proceeded thence to Croydon, via Clapham and Streatham, whence the route to Brighton was much the same as that now in existence. To this main scheme were added subsidiary projects in the shape of a line from Nine Elms to Shoreham-by-Sea, Sussex, via Dorking and Horsham, and a coastal branch to Portsmouth, this last with a view to ultimate extension to Southampton and Bristol. The scheme got so far as the issue of the prospectus of the grandiloquently named “Surrey, Sussex, Hants, Wilts, and Somerset Railway Company”, an undertaking that “failed to make headway until it cut off its extremities and changed its name”. Even after this surgical operation, nothing came of the project at first, but it is noteworthy that Rennie was sufficiently far-sighted to embrace in one system, in addition to Brighton itself, such places as Dorking, Horsham, Shoreham, and Portsmouth, all of which were subsequently brought within the territory of the London, Brighton and South Coast system. 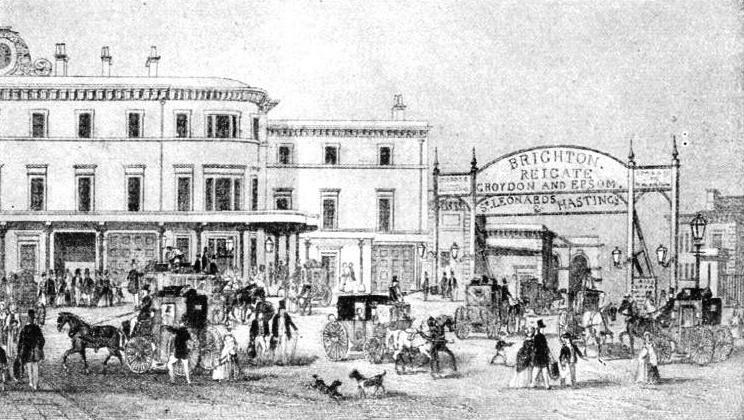 Brighton was at the time growing so rapidly in population, importance, and popularity, that railway connexion with London could not long be delayed, and in 1836 Parliament was called on to decide between no fewer than half a dozen rival routes, including one put forward by Rennie himself, but in a considerably curtailed form. 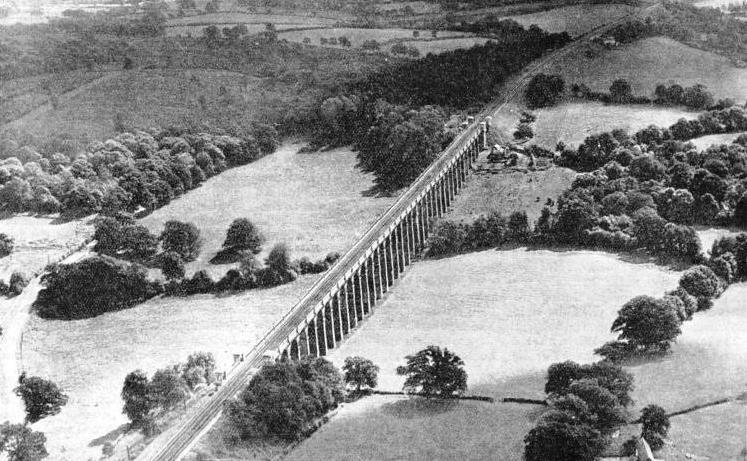 The six schemes speedily became two, owing to such reasons as disputes regarding the chairmanship of the company, lack of funds, and the ridicule thrown on one project because of its involving five miles of tunnels, and cuttings going down to a depth of 120 ft. The two left in the ring were those of Rennie and Robert Stephenson, between whom there was also a personal rivalry. This was due to jealousy on the part of Rennie and his brother, who had been among the foremost engineers of their day at a time when Robert’s father, George Stephenson, was still an obscure engine-wright at the Killingworth Collieries. Nothing was done in 1836, but in the next year, after a Parliamentary battle in which Robert Stephenson’s bill was passed by the House of Commons, only to be thrown out by the Lords, Rennie’s scheme was sanctioned, with certain alterations. As amended, the route to Brighton started at a junction with the London and Croydon instead of at Kennington, and had branches to Lewes, Newhaven, and Shoreham. The London and Brighton Company were also obliged to buy up the Croydon, Merstham and Godstone extension of the Surrey Iron Railway. Since this line, which was opened for traffic in 1803, and was the first in the world to be built with Parliamentary sanction (the earlier colliery railways in the North of England not requiring any legislative authority for their construction and working), the Brighton system can also establish a claim to be the real origin of the Southern. But the Surrey line never used locomotive traction, and was not a public railway in the real sense, although it has on occasion been described as such. 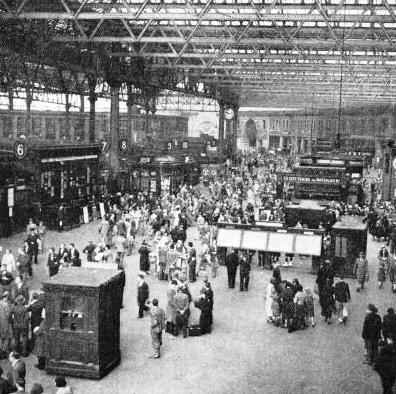 WATERLOO STATION IN 1910 was the terminus of the London and South Western Railway, the largest of the constituent railways embodied in the amalgamation of the Southern group. The LSWR had a route mileage of 1,019. The London, Brighton and South Coast system serves such centres as Eastbourne, Worthing, Chichester, Hastings, Tunbridge Wells, Portsmouth, and Newhaven. Portsmouth is not only a great naval centre, but also the chief gateway to the Isle of Wight; and Newhaven is an important Channel port. But it is with Brighton that the railway has always been most prominently associated. Indeed, if there is any town or city in the kingdom especially identified with a particular railway, it is Brighton, and it is not a mere matter of convenient abbreviation that caused the line to be known for so many years as the “Brighton Railway”. No one has in modern times ever thought of calling the South Western the “Southampton Railway”, or the Great Western the “Bristol Railway”, although as ports both those cities have an importance to which Brighton can lay no claim. This is not the place for a description of the popular seaside resort, which, together with the adjoining Hove and Kemp Town, has a promenade over five miles in length. But we are concerned with the fact that as a passenger traffic centre there is nothing else quite like it. Its stations receive visitors every day of the year, and no other place so far distant from any capital city to which it is connected has so many season-ticket holders. This partiality for season tickets on the part of the inhabitants of Brighton is by no means of recent growth. As long ago as 1889 it was observed that “if on a given day all the season-ticket holders in Great Britain were confined to their houses for the space of four-and-twenty hours, the fact would make little difference to the appearance of the “Dutchman”, or the “Flying Scotsman”, or the other great expresses; but the best trains of the Brighton Company would be little better than strings of empty coaches. The traffic has been created and encouraged by a fast and generous train service, which has become so frequent since the electrification of the main line all the way to Worthing, that time-tables are almost unnecessary, and no regular passenger need be annoyed if he has just missed a train. The distance from Victoria to Brighton Central Station is slightly under fifty-one miles. In view of the difficult terminal approaches at either end of the journey and the weight of the trains, the sixty-minutes timing, which is often bettered, represents, of course, something very much more than is suggested by the overall speed of fifty-one miles an hour. Among the trains that complete the journey in the level hour is the “Brighton Belle”, one of the most celebrated expresses in the country. This train, formerly known as the “Southern Belle”, makes six journeys a day, three in either direction. The “Brighton Belle”, which is composed entirely of Pullman cars, and is now, of course, electrically driven, began to run under its former title on November 1, 1908. But Brighton within the hour was a feat regularly accomplished before then, since a “Pullman Limited” with the same timings had been put on as early as October, 1898. This train, however, ran only on Sundays, leaving Victoria at 11 am and returning from Brighton at 9 pm. The “Southern Belle”, which carried first-class passengers only until 1915, has run almost every day of the year from its inception. Before the completion of the main line electrification between London and Brighton it made four journeys a day, the two additional runs being inaugurated in 1910. AN ELECTRIC EXPRESS, A six-car train operating between London and Brighton. Non-stop electric trains with corridor coaches depart from the termini in both directions every hour, running the fifty-one miles in sixty minutes. The first trip was made with a train composed of seven new Pullmans, hauled by an “Atlantic”. It “steamed out of Victoria Station with a company of distinguished passengers on board, and arrived at Brighton exactly one hour later”. On the coming-of-age run in 1929, which was also attended by festivities at Brighton, the locomotive was “Sir Ortzlake”, one of the “King Arthurs”, and its driver, Mr. W. Coughtrey, had been the fireman on the inaugural trip in 1908. During the intervening twenty-one years the train had carried over four million passengers. The London and South Western is the largest of the four main systems forming the Southern, its route mileage of 1019 amounting to nearly half the total. It derived its origin from a scheme for constructing a ship canal from Southampton to London, to avoid the longer sea journey through the Straits of Dover to the Thames, The canal project materialized up to the point of a survey of the proposed route, which was, however, found to be impracticable because of its cost. A railway scheme was substituted in consequence; and in 1831 there was issued the prospectus of the Southampton, London and Branch Railway and Dock Company, which intended to build a dock at Southampton as well as a railway. The route selected was via Basingstoke, the reason for the choice of this indirect line being that the promoters also had in mind an extension from Basingstoke to Bath and Bristol. The original scheme was abandoned, and in 1834 the London and Southampton Railway Company, which had dropped part of the original cumbrous title as well as the dock scheme, obtained from Parliament the permission to construct a railway seventy-seven miles long from Nine Elms to Southampton. A rather unusual feature of the project was that it had the support of both the naval and military authorities. The first section, from Nine Elms (now the goods station) to Woking, was opened on May 21, 1838, and by June, 1839, the line had reached Southampton, though there was still a gap in the shape of the nineteen-mile section between Basingstoke and Winchester. Pending the completion of this line, which was opened in May, 1840, passengers were conveyed over the intervening stage by coach, and this combination of road and railway reduced the time for the journey between London and Southampton to five hours. The system was built piecemeal. The section from Nine Elms to the present terminus at Waterloo was opened in 1848, the same year as the Fareham and Portsmouth line. Weymouth was reached in 1857, Exeter in 1860. The Seaton branch, in Devonshire, was opened in 1868. To describe the many other branches and extensions in the London district and outside would be tedious; but mention must be made of the Waterloo and City Railway, which was acquired by the London and South Western in 1898. The acquisition of this line, which has only two stations - at Waterloo and the Bank - and on which tickets are issued by the train conductors, is noteworthy, since if it had not been taken over it would doubtless eventually have been merged into the system of the London Passenger Transport Board. CARRYING THE MAIN LINE TO BRIGHTON. A splendid view of the Ouse Viaduct in Sussex on the Southern system. The track, now electrified, is carried at a maximum height of nearly 100 ft above the ground. The structure measures 1,475 ft in length. Evidently this pessimist did not visualize the day when Southampton, so far from yielding a traffic exclusively composed of prawns, would become the premier ocean passenger port in the kingdom. It now handles over a third of the total traffic between Great Britain and places outside Europe, while London and Liverpool each deal with less than a quarter. 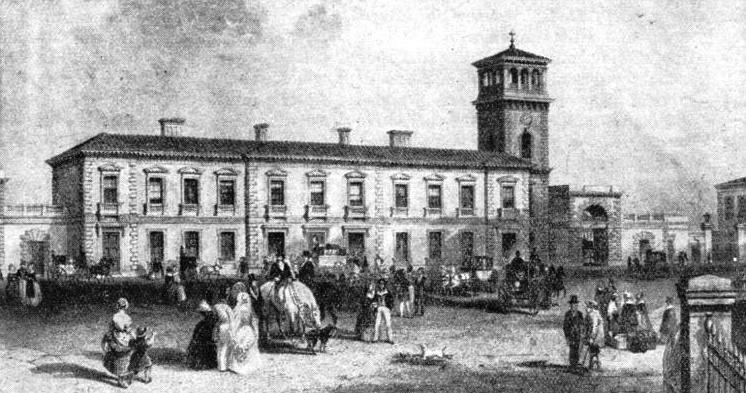 But in those early days many people had curious ideas concerning railways, and it is on record that when the South Western obtained power to build its station at Wimbledon, a gentleman who had just agreed to buy an estate there “appealed to the generosity of the vendor to forgo a portion of the price, in consideration of the injury that must be done to the property”. It is said that the owner of the house did agree to a reduction of the figure. The history of the London and South Western is largely bound up with competition with both the Brighton and Great Western systems. 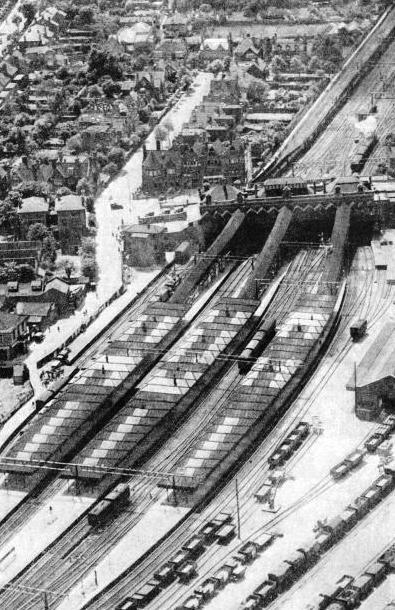 In connexion with the former, the construction of the Portsmouth branch led to what has been described as “exciting conflicts” with the Brighton’s employees; while the rivalry with the Great Western, which at one time extended also to the Channel Islands traffic, was accentuated in earlier days by the “Battle of the Gauges”, the South Western serving such broad-gauge strongholds as Exeter and Plymouth. The story, of this rivalry is too long to tell here, but reference must be made to one detail, the acquisition in 1845 of the little Bodmin and Wadebridge Railway, which, despite its short length - fourteen and a half miles of “main line” and branches - has an interesting history. The main section of seven miles, which was opened in July, 1834, was the first railway in the West of England to be sanctioned for locomotive traction. 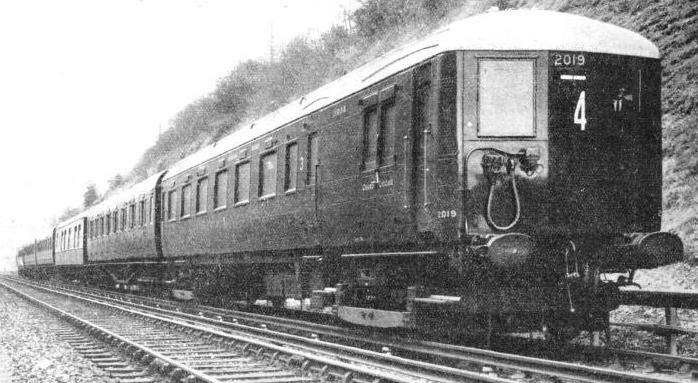 It was primarily built to serve as a mineral line, but it carried a few passengers, who were accommodated by a train running between Bodmin and Wadebridge on alternate days. The line was, of course, very much within the Great Western’s sphere of influence. and it is a curious fact that after the South Western had acquired it, it was not until half a century later that it was linked with the parent system. While on the subject of competition we may also refer to the fight for traffic between two ports on the South Western. When the then London and Southampton Company undertook to give Portsmouth railway facilities by the construction of a branch to Gosport, leaving the main line at Bishopstoke, the scheme did not meet with the entire approval of the inhabitants of the port, who desired more direct communication with London. This attitude was not unconnected with the long-standing rivalry between Portsmouth and Southampton, “whose very name stank in the nostrils of the citizens of the former, so that to be beholden to a railway company bearing the title of London and Southampton was unthinkable from their point of view”. Financial support for the proposed direct line was, however, not forthcoming, so that the citizens of Portsmouth, rather than go without any railway, agreed to the branch, while their “feelings were somewhat soothed by the tactful action of the railway company in changing its title to that of London and South Western”. THE NIGHT JOURNEY. A mixed-traffic locomotive of the Southern Railway negotiating a cross-over on its way to the south. Modern mixed-traffic locomotives on British railways are often of this “Mogul” or 2-6-0 type. They are used for slow passenger and express goods traffic. We have very briefly traced the beginnings, develop-ment, and ramifications of the principal components of the Southern Railway, each of which would require a lengthy book to do real justice to its interesting history. The importance of Southampton has already been mentioned, but it should be noted that the port is one of the very few in the world with accommodation both for berthing and overhauling the largest liners afloat. Moreover, its size can be gauged by the fact that it has 30,068 ft of quay length, as compared with 3,932 at Folkestone and 5,215 at Newhaven. Indeed, the quay length at Southampton amounts to five-eighths of that of all the company’s thirteen docks, harbours, and wharves, excluding the partly-owned Chelsea wharves. Mention of Folkestone and Newhaven is a reminder that in addition to its ocean-going traffic, the Southern handles the great bulk of the short-distance passenger business between England and the Continent. Its total number of forty-two steamboats is exceeded by the London, Midland and Scottish Railway, which owns forty-five, but the Southern has the largest number of vessels of 250 tons and over. In this connexion it may be recalled that the Company has not only been a pioneer in the employment of geared turbine steamers, but also that the South Eastern and Chatham were also among the very first to realize the possibilities of the marine turbine. The Queen, which was placed on the cross-Channel service in 1903, and was found to be faster and more economical than any previous vessel on the route, was at work only six years after the late Sir Charles Parsons had first publicly demonstrated the turbine steamship at the Diamond Jubilee Naval Review in 1897. As Southampton is the premier passenger port for long-distance traffic, so Waterloo claims to be the largest passenger station in the United Kingdom. In length of individual platforms, however, it is exceeded on the Southern itself by Bournemouth Central and Victoria (Brighton Section), and on other lines by several London termini, as well as by provincial stations such as York, Crewe, and Manchester (Victoria and Exchange). Moreover, both London Bridge and Clapham Junction handle more trains in a day. The present Waterloo Station, which has repeatedly been enlarged and improved since the opening of the original structure, contains twenty-one terminal platform roads and two other tracks, occupies an area of twenty-four and a half acres, and has a total platform length of 14,804 ft, the longest individual platform being 860 ft. The normal traffic is about 1,560 trains every week-day. EAST CROYDON STATION. An aerial view of the important Surrey junction on the Southern system, some ten miles from Victoria. It lies on the main line of the Central Section, formerly London, Brighton and South Coast Railway. 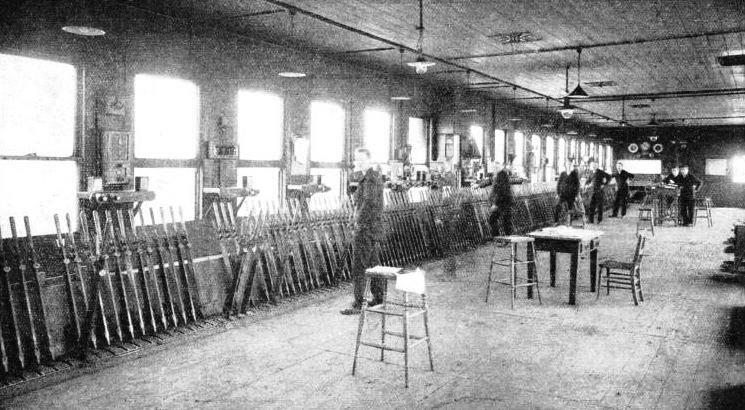 The present station was built in 1897-8. It has two signal boxes, respectively north and south of the station, each box having eighty-four levers. In addition to its size, Waterloo possesses another distinction because of its position south of the Thames. The London and South Western was the only main line entering London without a terminus on the north side of the Thames. That the line did not go beyond the Surrey side was due to financial considerations. The extension from Nine Elms to Waterloo was enormously expensive; and, although the station was not intended to be a terminus, and much of the necessary land and property had been bought for a further extension, and the company had planned to acquire Southwark Bridge, a financial crisis intervened. Thus the terminus remained at Waterloo. In size, this station is closely approached by Clapham Junction, which occupies an area of twenty-four and a quarter acres, besides having about ten and a half acres of sidings. With the exception of the London-Brighton and London-Exeter services, the systems composing the Southern have never been conspicuous for very high speeds. This is due to a variety of causes, including operating difficulties due to the congested London approaches, with their many junctions and branches, and to the many severe gradients. There is also another reason; except for the South Western section, the Southern is a system composed of a large number of such short lines that long runs are out of the question. Indeed, a study of the maps of the Brighton and South Eastern and Chatham shows that not a single run of a hundred miles from a London terminus is possible on these constituent railways of the Southern. In such conditions speed must be more limited than on the main lines to the north and west, where uninterrupted runs of three and four hundred miles are possible. The main line on the Chatham and Dover section is the steepest out of London, and has the added handicap of being composed of a constant series of switchbacks. Locomotives are most severely taxed on the up journey: immediately on leaving Dover there is a “bank” of 1 in 105, and a further rise of 1 in 132 to the summit at Shepherd’s Well, six and a half miles out; while from Canterbury to Selling there is a five-mile incline at l in 132; beyond Rochester comes the six-miles Sole Street incline, which is nearly all 1 in 100. On the Kent Coast line, the gradients are even steeper, the section from Ramsgate to Broadstairs involving a climb of 1 in 75, followed by both a rise and fall of 1 in 100 near Herne Bay. Moreover, the Ramsgate-Broadstairs line is not the steepest, the Dover-Deal branch having a ruling gradient of 1 in 70. On the Swanley-Maidstone-Ashford line, which forms an alternative route to the coast to that provided by the South Eastern, the gradients range from 1 in 80 to 1 in 100. On the South Eastern main line there are both rising and falling gradients of 1 in 120 on the Sevenoaks-Tonbridge section; in the London area four miles of the Crystal Palace branch ascend at 1 in 78; and, although the ruling gradient between London and Brighton is 1 in 264, the first three-quarters of a mile out of Victoria involve a climb of 1 in 64. 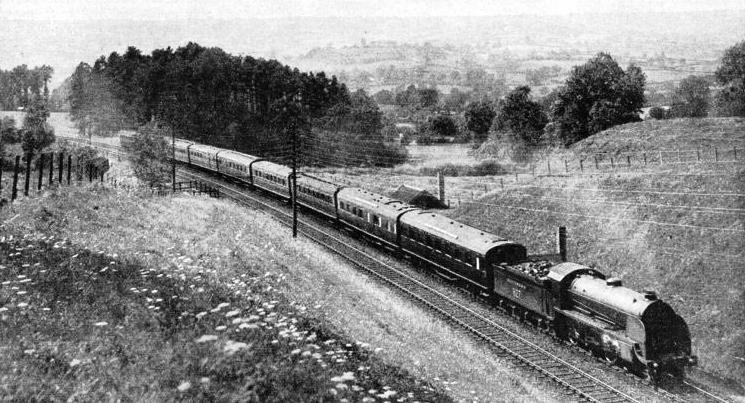 The Salisbury-Exeter section of the London and South Western is one of the steepest main lines in the country, the eighty-eight miles forming a constant succession of switchbacks, with many miles ranging from 1 in 80 to 1 in 100, concluding with a brief 1 in 37 at Exeter. In spite of this some excellent running is often made. It will be realized that such a combination of steep inclines and short runs does not make for the highest speeds, and the Southern’s locomotive working is far more creditable than it may appear on paper. The system has been fortunate in a series of talented locomotive engineers, among whom must be mentioned William Adams, Dugald Drummond, and R. W. Urie, of the South Western; James Cudworth, James Stirling, and William Kirtley, of the South Eastern and Chatham lines; William Stroudley and D. Earle Marsh, of the Brighton. The present Chief Mechanical Engineer, Mr. R. E. L. Maunsell, has already done much to standardize the number of types in service. Among other Southern types may be singled out Wainwright’s standard 4-4-0 expresses for South Eastern and Chatham main line service; the “King Arthurs”, “Lord Nelsons”, and “Schools”, designed since grouping for hauling the fastest and heaviest steam passenger trains; the Brighton “Baltic” and “Pacific” tanks; and the 2-6-4 tanks introduced in 1917. Many of these tanks have been rebuilt as tender locomotives. The Southern’s electrification is the largest scheme of its kind in the world. Including the Hastings and Eastbourne extensions in hand, the electrified route mileage will amount to 447, which is equivalent to 1,147 miles of track. In addition to being the largest suburban electric system in existence, this conversion is the first main line electrification in Britain. A “SCHOOLS” CLASS ENGINE. These 4-4-0 passenger locomotives are claimed to be the most powerful of this wheel arrangement in Great Britain. They have two outside cylinders and one inside cylinder. The driving wheels have a diameter of 6 ft 7 in and the three cylinders are 16½ in by 26 in. The overall length of engine and tender is 58 ft 9½ in and engine and tender weigh 109 tons 10 cwt. The working pressure is 220 lb. You can read more about “The Atlantic Coast Express”, “The Golden Arrow”, “On the Footplate of a Night Goods” and “The Thirties, Southern Railway” on this website.